Despite the widespread use of endoscopic mucosal resection (EMR) in patients with early gastric cancer (EGC), its longterm outcomes have not been fully evaluated. Our aim was to evaluate longterm survival after complete EMR for EGC. From patients who underwent EMR between 1978 and 1996 at our center, we enrolled 131 patients with differentiated mucosal EGCs less than 2 cm (without ulcerative change) that had been completely removed by EMR. The vital status of the patients at the end of December 1998 was confirmed by the hospital cancer registry, which is linked to the Osaka Cancer Registry. A total of 124 patients (95%) were completely followed-up. 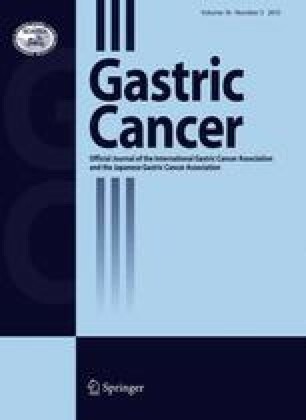 Two patients (1.5%) died of gastric cancer and 26 died of other causes during the mean observation period of 58 months. The overall 5- and 10-year survival rates were 84% and 64%, respectively. The disease-specific 5- and 10-year survival rates were 99% and 99%. En bloc EMR ensured an excellent prognosis, and should be the first choice of treatment in patients with small differentiated mucosal EGC. Careful histological examination and longterm endoscopic surveillance are important.